(LAS VEGAS, NV) – Today, Secretary Hillary Clinton met with hard-working retail workers from across the industry to discuss the issues impacting them, their families, and co-workers. During the meeting, the workers talked about their day-to-day challenges, including workplace intimidation, scheduling and unpredictable hours. The emotional visit with Clinton included workers from Albertson’s, Macy’s, El Super and Stater Bros. The meeting with Flora Castaneda and Yolanda Pivaral, both El Super workers, was especially powerful as they highlighted the company’s ongoing intimidation and failure to recognize their right to negotiate a better life and a contract providing better wages and benefits. They have both worked to organize their stores and join the UFCW. Sherry Hamilton, who works as a union representative at Macy’s, discussed that while UFCW provides people with higher wages and protection, the non-union retail industry is still defined by unpredictable scheduling that makes it impossible to go to school, spend time with family, or have control over one’s life. 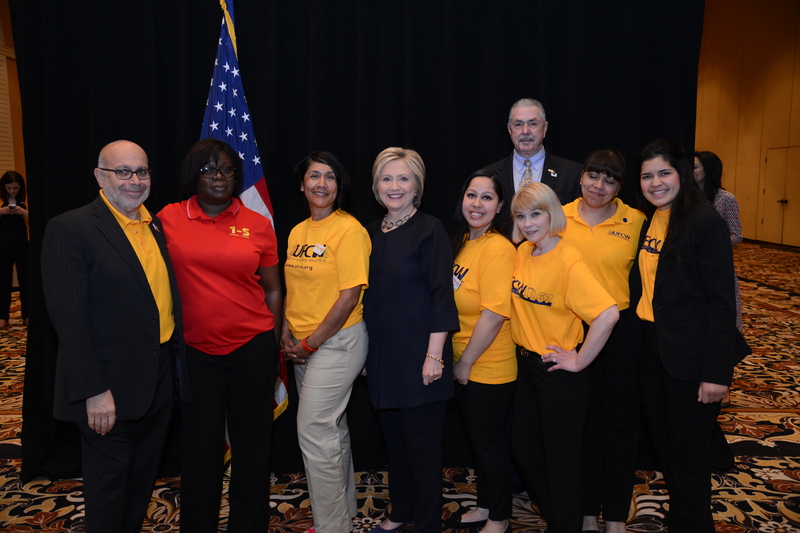 Clinton also addressed the UFCW conference, and was introduced by International President Marc Perrone. In January 2016, after surveying its membership across the country, UFCW endorsed Sec. Clinton. This is the second time Sec. 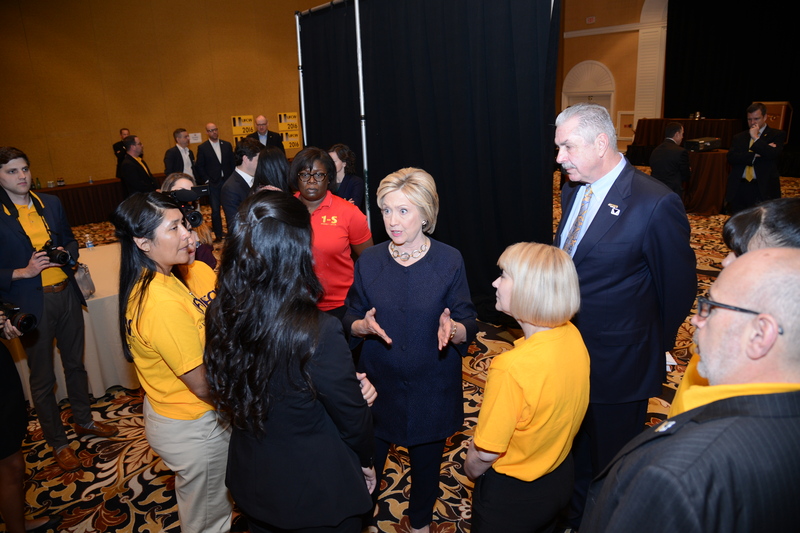 Clinton has personally spoken with retail workers who are part of the UFCW. The retail sector is one of the fastest growing parts of the economy, but 40 million retail workers face challenges from erratic schedules, split shifts and part-time hours that make it difficult to live a stable life, manage a second job, or coordinate care for their families. These are common concerns throughout the industry and are a major reason why more and more retail workers are considering the benefits of joining a union. Earlier this year, UFCW announced it already had 100 organizing wins in 100 days, reflecting workers desire to work together to secure their lives and futures. Yolanda Pivaral is 23, works at El Super Store #13 located in Los Angeles, CA and has been a cashier there for 3.5 years. She is a single mother to a six year old boy. She and her son live in Los Angeles. Yolanda is also furthering her education and is studying Communications at the California State University, Los Angeles. Yolanda has currently been getting more involved in her union. She has become trained and is now helping to do workshops to help make fellow union members US Citizens, through the Union Citizen Action Network. Flora Castaneda 44, has worked as cashier at El Super Store #17 located in Los Angeles, CA for 12 years as a cashier. She is a single mother of three children. She and her children live in Los Angeles. Flora is a member of the bargaining team. She and her fellow co-workers have been fighting for over two years for adequate paid sick days, better wages, better benefits, more affordable health care, a fair seniority system, and respect. Sherry Hamilton is 50, and was a sales associate at Macy’s in the Bronx for 17 years. After joining Local 1-S while working at Macy’s, she later joined the Local 1-S team where she now serves other Macy’s employees for the union. UFCW is the largest private sector union in the United States, representing 1.3 million professionals and their families in grocery stores, meatpacking, food processing, retail shops and other industries. Our members help put food on our nation’s tables and serve customers in all 50 states, Canada and Puerto Rico. Learn more about the UFCW at www.ufcw.org. This is the website for UFCW members and friends to learn more about the issues we're working on and how to get more engaged. To visit the main website for UFCW International, go to www.ufcw.org.